If some of MIT's pioneering alumni could return to campus today, might they not ask, "What happened to the spirit of originality? Don't they tire of painting over the same old Smoots?" Those who've heard of Oliver R. Smoot, Jr. '62 may also have heard of another pioneering undergraduate, Richard P. Feynman '39, who later went on to win a Nobel Prize in physics. In his autobiography, Surely You're Joking Mr. Feynman, Feynman tells the unforgettable story of people who still live by ritual and imitation, rather than by understanding. Now people will laugh at a student who would attempt, by taking the exact courses and doing all the things Feynman did at MIT, to capture the spirit and intellect of Feynman, or to have as much fun as he did. Yet these very same people will paint Smoots ad infinitum. The question of putting Smoots on the restored Massachusetts Avenue Bridge is now front page news for The Tech. One fraternity member was quoted as saying his group has preserved the Smoot to Smoot distances on a piece of string ["364.4 and an ear... Smoot legacy lives on," Jan. 18]. Undoubtedly this precious relic is being reverently preserved in the innermost holy chambers of that fraternity. Perhaps it is stuffed in an empty bottle of Sam Adams. Let us not confuse the ritual of painting over Smoots for the original spirit that gave birth to Smoots. It is one thing to be aware of things past, and wonder how they came to be, but it is another thing to adhere to old forms simply because they are there. The former is an appreciation of history, the latter a mockery of it. 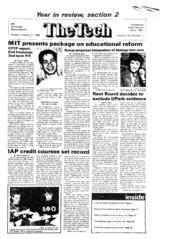 Would the Smoots and Feynmans of 1989 enjoy the MIT of today? Or would a prevailing Pacific island mentality drive them to sunny California with the rest of the "brain drain?" By now Oliver Smoot and his two cronies, I wager, would have carried through one if not several "ideas" to replace the old ritual and to keep the Pacific islanders at MIT busy for yet another quarter century.